I’ve just got back from a week in Rhodes (or Ródos) with my mum. The purpose of the trip was relaxation first-and-foremost, which was easily satisfied at our nice four-star hotel in Kolymbia on the east coast of the island. The large pool was overlooked by palm trees; there was a good restaurant with a regular supply of grilled fish and nice Greek wine; and it was a two minute walk to the beach: perfect. Days spent indulgently reading by the pool or swimming in the sea were interspersed with some (gentle) exploration of the island. 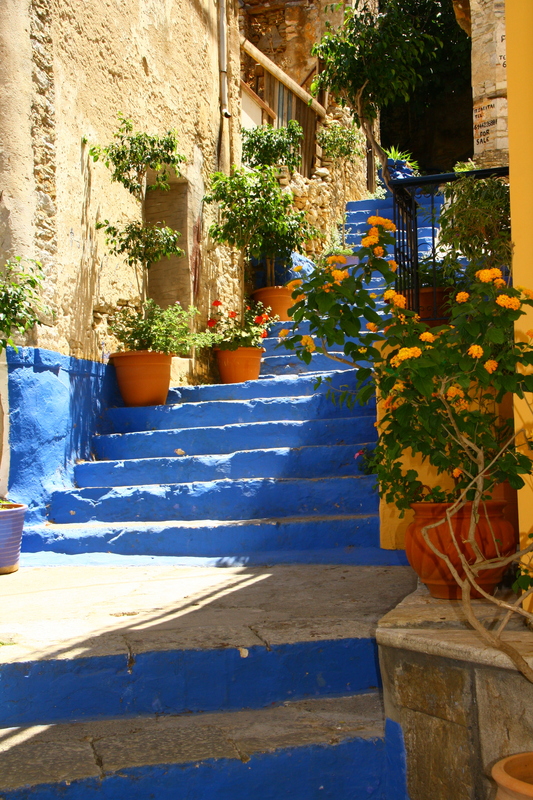 Ródos is the largest of the twelve Dodecanese islands in the east Aegean Sea and is actually much closer to Turkey than to the Greek mainland. Having been occupied by the ancient Greeks, Persians, Romans and Turks, the island was taken in 1309 by the Knights of St John – a Christian military order originating from Jerusalem. 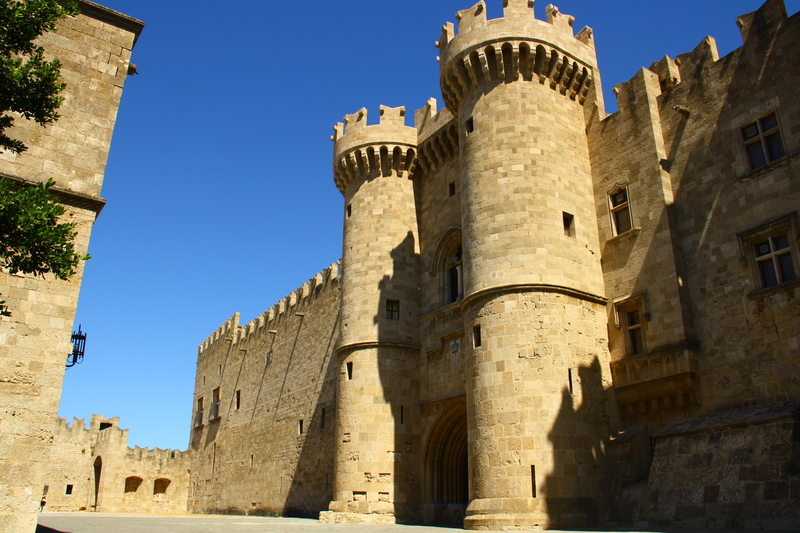 The Knights’ occupation lasted over two hundred years, during which time they fortified the island and saw off an attempted invasion from Egypt. In the 16th century, however, they were defeated by Suleiman the Magnificent and the island fell back under Turkish rule. The Ottamans stayed for almost four centuries, until Italy seized all of the Dodecanese isles in 1912. Finally, in 1947, the island was reunited with Greece, becoming one of the country’s 227 inhabited islands. No-one can claim that’s a boring history! On our first trip into Rhodes Town, the capital of the island – and indeed the whole region – it’s fair to say we got a little lost. The old part of town, within the fortified walls, is divided into the Knight’s, Jewish and Turkish Quarters (though mathematicians amongst you might suggest that should be Thirds) and is criss-crossed with narrow, cobbled streets. It didn’t help that I navigated us in through the wrong gate, taking us around the dry moat and in at the opposite corner to which I’d intended. Thus every direction I gave from that point on was utterly wrong. We still managed – somehow – to find the Palace of the Grand Masters. And then you’d think with that bearing, I’d have got back on track. But, no. The Palace itself is an imposing medieval structure that looks like the sort of castle you’d see in a film like Prince of Thieves, full of dark corridors designed to be run down with a flaming torch to escape from Alan Rickman. It doesn’t take long to walk around and provides welcome shade from the stifling streets outside. Continuing through what I thought was the Knight’s Quarter, we came across the Mosque of Suleiman. That’s when I gave up on the map. We proceeded then to lose ourselves in the street bazaars for a while, occasionally scratching our heads at a familiar sight, but mainly wandering aimlessly, until we finally found ourselves on Sokrátous, the main thoroughfare. And from there, we found the main square, Platia Ippokrátous, and confirmed what I’d known for a while – we’d been going in circles. This proved an opportune time to stop for lunch in a café! Sated by calamari and banana split, and on surer footing with the map, we explored some more of the Turkish and Jewish Quarters and the remains of the Episcopal Palace, then exited via Liberty gate to the harbour. 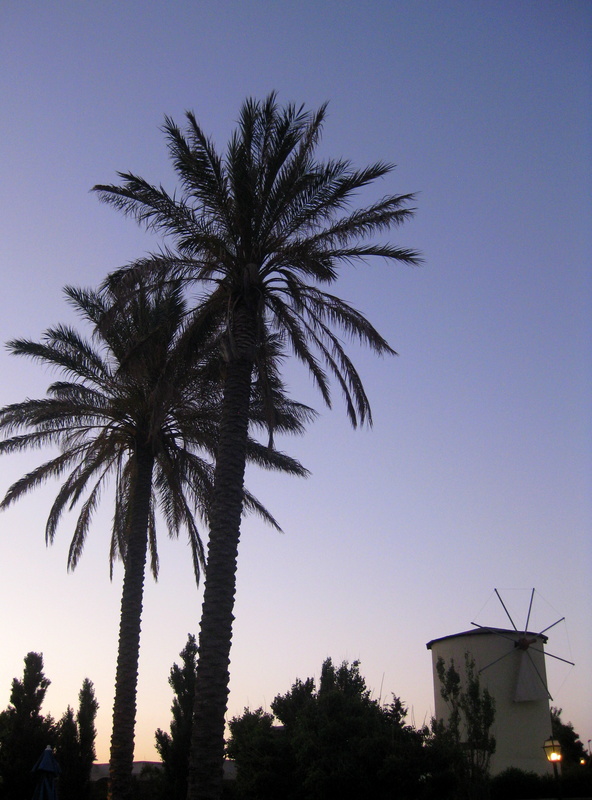 The seafront is really lovely – crystal-clear aquamarine water with little bobbing fishing boats, backed by high walls, windmills and forts. Having walked the length of the harbour-front and feeling ready for a sit down and a swim, we headed back through town – unexpectedly finding Ippotón, a narrow cobblestoned street with the Inns of Italy and Spain and the French Chapel – and out via Amboise Gate, across a stone bridge over the moat to the bus station. On our second trip into town, we arrived late afternoon and went to the Archaeological Museum housed in the old Knight’s Hospital and then for an evening meal at Nireas fish restaurant on Sofokléous. I’d read good reviews of the restaurant before the holiday and we were not disappointed – delicious king prawns, swordfish and an enormous Greek salad proved more than enough to share and the owner was a wonderful host, even if slightly preoccupied by restaurant politics and the impending descent of a film crew. The town is beautiful at night, with fairy lights in restaurants and on trees and the city walls and forts illuminated. I even managed to successfully navigate to and from the restaurant in the dark! Later in the week, we spent half a day at Lindos, with its impressive (and very high!) acropolis, a 4th century BC temple with medieval fortifications added by – yes, you’ve guessed it – those Knights of St John. Lindos was once one of the most important commercial cities in antiquity, with a population of 17,000. Now there are only about 700 permanent residents and the town’s sole focus is tourism. The local bus from Kolymbia took us to the foot of the hill, from where we hitched a donkey ride to the entrance of the acropolis. The views from the top, down the Aegean coast and out towards Turkey, are splendid and Lindos itself, with its white-washed homes and little churches, is very pretty. Having climbed to the top and spent some time around the Doric ruins, we spared our donkey the load and walked back down along the steep, dusty track, rewarding ourselves with a chocolate crepe and ice-cream in the town. Our final trip was to Symi, another of the Dodecanese isles, taking its name from the nymph Syme of Greek mythology. 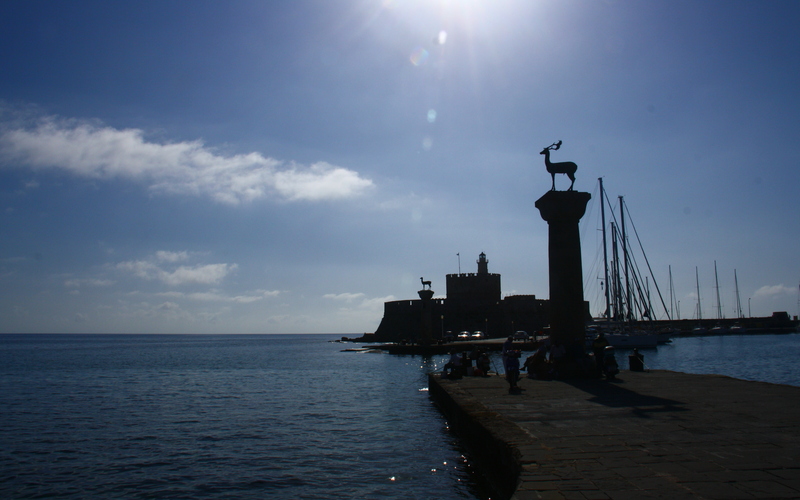 The island is a 90 minute boat ride from the port of Rhodes and is only a stone’s throw from Turkey. It was the only island of the twelve to remain free during the Turkish occupation and as a result became incredibly prosperous, mainly as a result of the ship-building and navigation skills of its inhabitants and its extensive sponge harvesting. At its peak in the 19th century, the small island’s population reached nearly 30,000. Sponges are still exported all over the world, but now, with the decline of the industry and the economic downturn, the population lies closer to 3,000. We first stopped at Panormitis on the south side of the island, where we were able to look around its famous monastery. 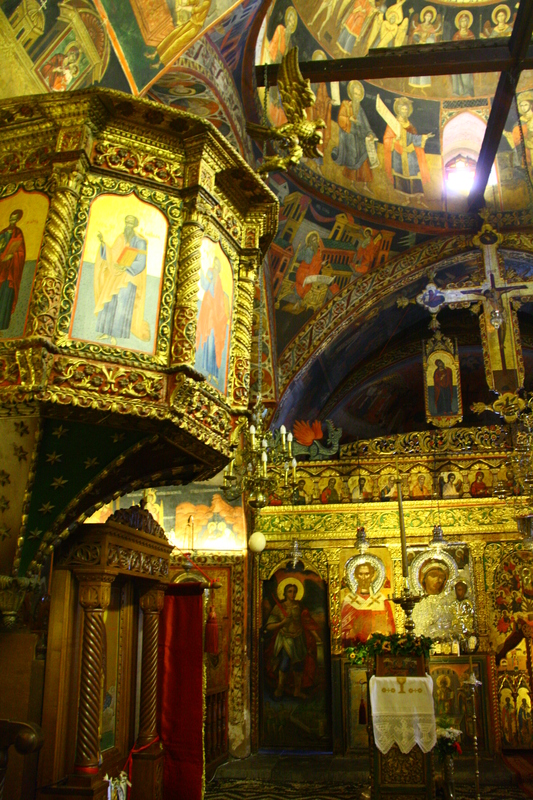 Inhabited now by only 8-10 monks, pilgrims nevertheless travel from all over the globe to pay homage to St Michael of Panormitis and the tiny chapel was well worth the stop. 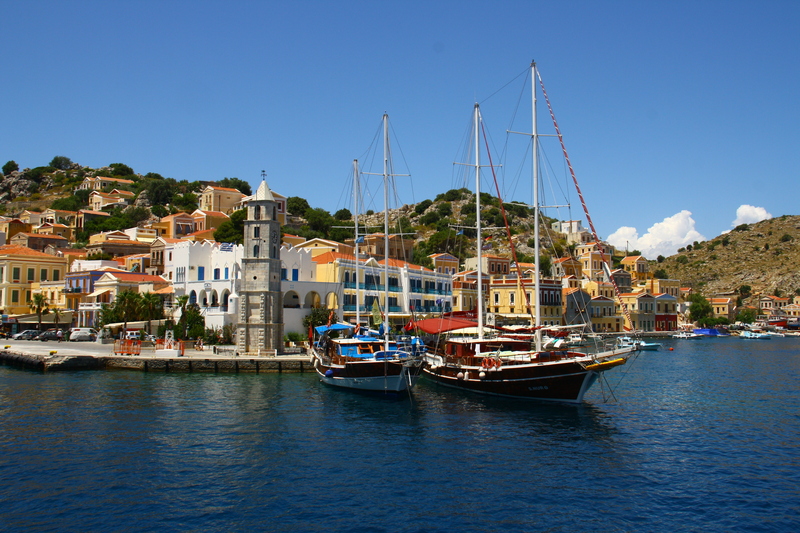 On the northern side of the island, a further 40 minutes by boat, the town of Symi is absolutely stunning! Bright coral and citrus-coloured neo-classical houses tumble down the hills to the harbour, making the stroll around the two sweeping horseshoe-shaped stretches of waterfront an absolute delight. It really is one of the most picturesque harbours I’ve seen, dotted with green and blue fishing boats and banked by an array of seafood cafés. We ate sea bass and moussaka at restaurant right on the water’s edge, also called Nireas coincidentally. Symi is named in Homer’s Iliad as the home of King Nireus, who fought in the Trojan War on the side of the Greeks, so there is no shortage of places bearing his name. After a very pleasant couple of hours wandering the colourful streets and a stop for a paddle in the sea, we boarded the boat back to Rhodes. I’d definitely recommend going to Rhodes for a short, relaxing break, particularly if you’re looking for a few interesting sight-seeing trips to mix things up. This entry was posted in Travel and tagged Greece, Knights, Lindos, Rhodes, Symi, Turkey on June 14, 2013 by victoriassecretblog. I’m gonna visit it soon, very useful review, thank you!